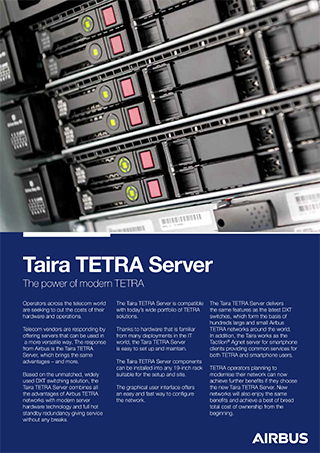 Taira TETRA Server is the heart and brains of a TETRA network. Thanks to its server hardware, it is easier for you, and saves you money and time. Taira TETRA Server is also a key building block for evolving TETRA networks to hybrid and broadband LTE. Therefore it delivers a future that you can trust. Taira TETRA Server is the smart choice for secure radio communications. It offers the powerful features familiar from the ones that the DXTA TETRA Server delivers, from seamless group communications to one-to-one and broadcast calls; and from end-to-end encryption to a wide variety of privacy and security schemes. The components of Taira TETRA Server can be installed into any 19-inch rack suitable for the setup and site. Familiar hardware. Thanks to the server hardware that is familiar from many deployments in the IT world, Taira TETRA Server is easy to set up and maintain. It offers the highest possible availability service when needed, with easy hot standby replacement. Data center compatible. It can also be a natural part of you data center. Easy configuration. The new graphical interface offers an easy and fast way to configure the network. Saves energy and floor space. Taira TETRA Server is very compact in size, and this means that it requires less floor space. Smaller size also means less energy required to run it. Cheaper to maintain. The fact that Taira uses standard hardware means that your maintenance personnel do not have to acquire extra competences. For you, this means lower operational expenses. Taira TETRA Server is quick and easy to set up. Upon delivery, Taira can be ready for use in two hours. Taira TETRA Server is a key building block for evolving TETRA to hybrid and broadband/LTE networks. Therefore, it delivers a future that you can trust. With smart broadband applications such as Tactilon Agnet and the ones available from the SmarTWISP app-developer community, you are ready to step right into your smart future. What's more, Taira is completely scalable from a deployable, single-base-station site to nationwide networks. You can start small and expand as you need. Taira 330 is a high-availability TETRA server providing you with a fully redundant cluster. With Taira 330 you can implement a real georedundancy to your network by dual homing the base stations. Taira 330 is 6U high including three x86 servers that can be installed into any 19-inch rack suitable for the setup and site. Graphical user interface of Taira 330 enables fast deployment whereas remote network management saves you money and time. Even new functionalities can be added without any HW upgrade or site visits. For more details, please, download the datasheet. Taira 310 is a single server custom built for TETRA switching by putting together HPE Prolient DL380 hardware with Linux-based OS. Taira 310 is one 2U high x86 server providing standard HW redundancy on power supplies and hard disks. It can be installed in any 19-inch rack. With Taira 310 no special technical expertise is required for a small system setup. You can 'plug and play' with automated scripts and save time. 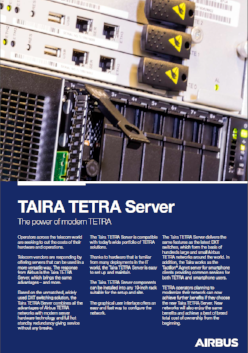 Download the datasheet to learn more about the capacity and characteristics of Taira TETRA Server. Taira TETRA server 310c is designed for Claricor® TETRA systems, which are especially suited for transport, energy and industry use. Taira 210 is a single node CEF variant of Taira TETRA server, designed for deployable TETRA solutions. Accompanied by selected power supplies and a gateway for connections Taira 210 turns to a full-blooded TETRA switch that is always installed in a rugged cabinet that can be deployed even on the move.